American author Henry David Thoreau once wrote, “I took a walk in the woods and came out taller than the trees.” For Siyuan, taking the time to explore the world in which she lives has made her open-minded, strong, and courageous. Her naturally investigative personality drew her to hiking, her favorite way of gaining a deeper understanding of the world around her. Eventually, her yearning for exploration would take her farther than she expected. At twenty-five years old and newly married, Siyuan made the big move from China to the United States. Leaving everything she knew behind, she remained unafraid and prepared for the challenge of making a life somewhere completely foreign to her. Once settled in the U.S., Siyuan reflected on her upbringing in China and the turmoil there, provoking her interest in the rule of law. She took her questions with her to the University of Southern California, where she earned her J.D. at the Gould School of Law. Acquiring the knowledge she craved, Siyuan now continues to relentlessly take the next steps through every twist and turn of her work, as well as her hikes- facing each calling with open-mindedness and determination. 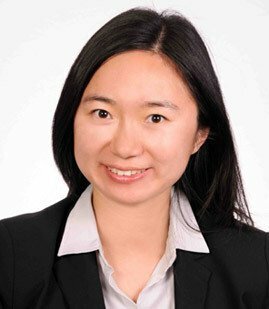 Likening her practice of law to a long hike in the woods, Siyuan often says a project can cause physical and mental exhaustion, but if you accept the challenge and take in all life has to offer, you come out more accomplished, insightful and confident. Corporate transactions, including formation of business organizations, corporate finance, private placements, state and federal securities reporting; contracts, licensing and regulatory issues including international trade; general corporate representation. Served as counsel for clients in mergers and acquisitions of U.S. companies, including acquisitions by foreign buyers. Represented clients in private placements, including structuring and implementing EB-5 related investments through the Immigrant Investor Pilot Program; drafted related private placement memoranda, subscription agreements and offering documents, as well as loan and security documents. Formed corporations, LLCs, and partnerships in and outside California, and drafted corporate governance and compliance documents. Advised on regulatory compliance at the federal, state and local levels for businesses in the security alarm, restaurant, and importation sectors. Drafted distribution, supply, sales and service contracts for businesses, with a focus on the security alarm industry. Assisted in preparing loan documents and participated in the closing of credit facilities and term loans for major U.S. banks. Drafted letters and prepared forms for L-1 applications. Clerked for Judge Carmel Agius at the International Criminal Tribunal for the Former Yugoslavia. Authored a series of published articles on legal issues related to doing business in the United States for the 21 Century Media online newsletter, one of the largest Chinese business news publications.